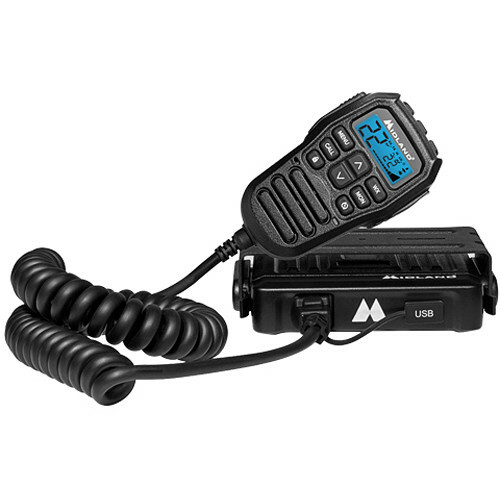 MicroMobile MXT275 15-Channel Two-Way GMRS Radio is rated 4.9 out of 5 by 67. Rated 5 out of 5 by vlxjim from Space Saver with all the features. I've had this radio installed in a Jeep JK for about a week now. Besides using this for off road fun I'm also volunteer zone leader for our local fire council in which we operate two GMRS repeaters which we use for local emergency and disaster relief communications. Having the repeater channels is a plus and I can see other members adding this to their vehicles. I'm also a licensed ham radio operator I can tell you this radio is built as well as the amateur and professional radios that I'm used to operating. Besides the MTX 275, I also own the MTX 115, MTX 100 and a few T70 handhelds. Rated 5 out of 5 by Trail.or.Sail from Excellent Range and Reception and Easy to Use! We upgraded to the MXT275 last month. We have been using our Midland FRS/GMRS handhelds for 2 years between vehicles. However, over the horizon communication was not always possible, and keeping track of a handheld while offroad is not always easy. The MXT275 has increased our range and reception beyond our expectations! The setup on our dash and ease of use of the radio makes this a perfect upgrade. I can highly recommend this setup to anyone! Rated 4 out of 5 by ChaserTech from Excellent GMRS mobile! I got the MXT275 on pre-sale, and did an unboxing and installation video, and have been using it for over a month now. This is an amazing GMRS radio with a decent range. I have little to no interior room in my car, so this was perfect. The control head is attached to a mount that I made out of a ProClipUSA mount, a RAM arm mount, and some ABS plastic sheet. I initially used this radio with a PCTel unity gain NMO mount antenna, but have since moved on to a Larsen LP450NMO puck, and have seen a jump in performance. Can't recommend this enough. The only feature I could ask for would be an ignition sense wire, or an ignition status sense that would turn the radio on when the ignition is turned on, as I have mine wired to an ignition-controlled fuse block, and have to turn it on manually every time I start the car. Rated 5 out of 5 by Briansfarmingvideos from Great Tractor to Tractor communication We recently bought 11 micro mobiles and 4 GXT1000 radios to better improve instant communications on the farm. So far 2 weeks into the switch we are extremely please and satisfied. We have them in all the tractors and combines as well as the semis. Range is better than we were experiencing with our CB’s and seems to be more reliable. We have 4 mxt115’s and 4 mxt275’s as well as 3 mxt400. Doing. It over I would have went with 8 mxt275’s for the equipment due to better versatility. I plan on doing a full YouTube review in the near future. Thanks for an awesome product. Rated 5 out of 5 by Donald from Love this radio Live on a small farm/ranch with lots of animals and it is more convenient to have radios to communicate with than with using text with the phone and the response is much quicker. The Midland Radio MX275 with all the controls in the handset is the best. I have installed in my UTV and can travel all over the farm and get great and crystal clear reception with the two Midland handhelds 1050's that I also purchased. I have a lot of animals to tend to and sometimes need a quick response and this radio meets need nicely. I plan to purchase several more to add to my other farm equipment and trucks. Rated 5 out of 5 by itsbobbyagain from Great for Off Roading Handset feels super solid, a little heavy, but overall a solid handset. I used this radio on a trail run in the Colorado mountains, it performed very well. The range was really good when talking to other Midland handhelds. Rated 5 out of 5 by Sweet P from Perfect for cars w/ little dash space My Subaru Forester lacks a good mounting option on the dashboard to instal a MXT105 or 115... With this MXT275 I can keep the whole base and power cord neatly hidden in my armrest console, and when not in use, I can easily keep the microphone in there too. The controls are easy to use and very intuitive. I’ve never been able to convince my wife to get a HAM license, but this radio is so easy to use, she wants one now for emergencies. Rated 5 out of 5 by MJ in AZ from Great Power in a Small Package ! A couple of us bought these to replace our Cobra 75 CBs. CBs on the trail or overlanding just don't make the grade, the Midland MicroMobile is a definite improvement over any CB. We mounted the "guts" of the radio behind our glove compartment doors so the only thing you see is the all in one microphone. We also opted for external speakers to hear better with the top and/or windows down. Easy range of several miles on the trail compared to less than a mile with the Cobra 75 CBs. A fantastic improvement and absolute clear reception of everyone else in the group. Once the rest of the off road community sees that CB is a "Model T" and GMRS MicroMobiles are Ferrari's, everyone will have one.